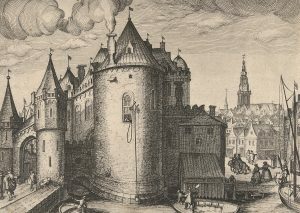 When the Waag was build, it was the access gate to the medieval city. The name was the Saint Anthony’s Gate . It’s one of the oldest buildings in Amsterdam. 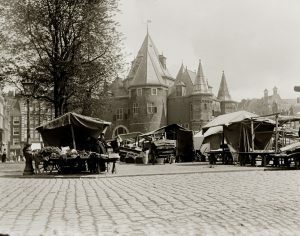 The Waag is located on the Nieuwmarkt. In medieval times the city was surrounded by a defensive wall. When the city expanded the wall was extended to the new outskirt of the city. The big blocks of sandstone are still visible in the construction of the Gelderskade. When the city wall was removed the building got a new function. 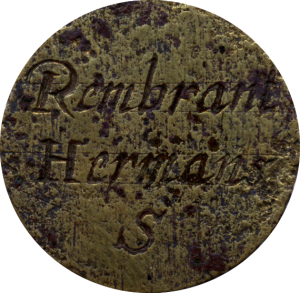 It became an important hub for the citizens of Amsterdam. It was one of the busiest buildings and housed many Guilds. All the goods could be weighed here and checked on the quality of the merchandise. On the top floor you had the guilds that each had their own entrance and stairs. The marks of those guilds are still visible, as are the doors leading to their former offices. brandt was a member of, was called St. Luke. Different types of craftsman where member of the Saint Luke guild. The door that leaded to their office is still there. The only prove of him being a member, is a memberships coin of him. The archives of this guild unfortunately got lost during a flood. Between 1690 and 1691 they build a dome to close off the inner courtyard. In the year 1819 the last goods were weighed there (indigo) and lost its function of a weighing house. After losing the function of a weighing house it had many functions: fencing station, workshop for city lighting, fire station and an archive for the city of Amsterdam. Capital punishment has been done once, while using a guillotine. 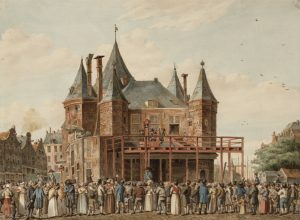 Three convicts were executed in front of the Waag. This happened more often it was a big spectacle because they used it for the first time in Amsterdam. Amsterdam and the rest of the Netherlands were under the rule of the French empire. The three criminals were convicted of murdering three people (two murders proven), while using arsenic poison. Their names were: Hester Nepping, Gerrit Verkerk and Adriana van Rijswijk. Normally the place for these public punishments where done on Dam square. The archive made room in the 20th century for the Amsterdam (historical) Museum and the Jewish Historical Museum (moved away in 1987). 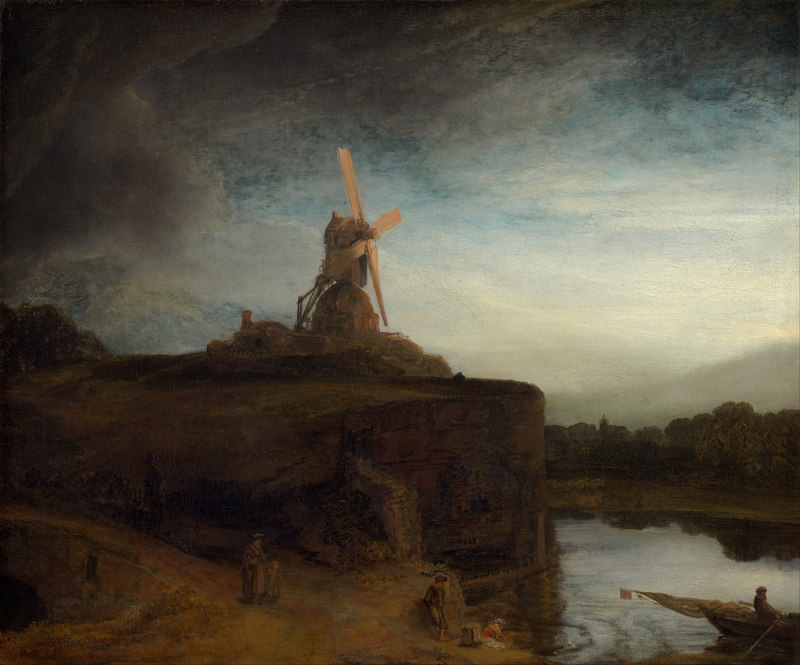 The Amsterdam Museum moved away earlier, in 1975 it went to his current location. The building needed a lot of attention and caring. 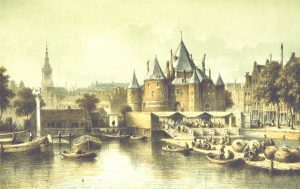 Although the Waag was originally build to function as a defensive gate. The many years of usage were reason to start a big restoration project. The building is still being watched periodically, caused by the potential risk that one of the towers would collapse. 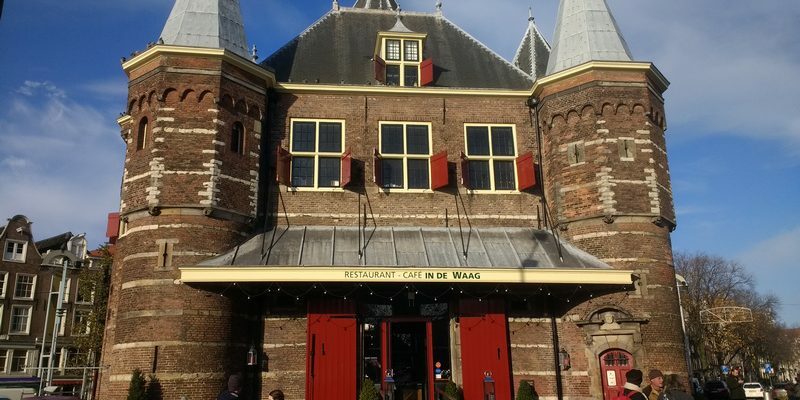 Currently there´s a restaurant in the Waag, as is the Waag society.